This is going to be a two-part post starting with the dress. 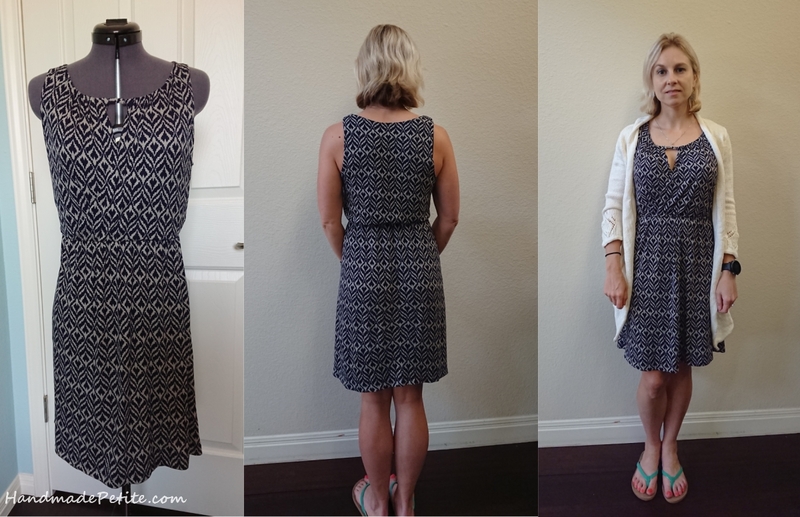 This is McCall's 7591 pattern view C. It's a pullover dress with elastic waist for stretch knits and looks like it can be dressed up or down depending on the fabric and accessories. When the pattern first came out, what drew me to it was the keyhole neck detail. I know some people didn't like the pattern because of the gap at the bust, but I overlapped the bodice pieces more than the pattern called for, shortened the keyhole to 1" and added few invisible stitches to keep the two overlapped sides attached and keep them from gaping. I took all the pictures in a rush so they're not very good and it's difficult to see this, but with above changes my version of the bodice is more form fitting. I still wouldn't wear this dress to work without a jacket or a cardigan over the top, but it's a great weekend day dress or casual going out dress. I made a few other changes that are typical for me. I'm 5'1" and took out ~1.5" at the waist and another 2" from the hem so the dress hits right above the knee. Having extra fabric at the waist was actually helpful because it made putting in the elastic casing much easier. I also eliminated the slit in the skirt. I think it looks nice and added some drama in the long version of this dress, but I preferred to not fuss with it on the short version. Overall I would rate the pattern as average. I'll make it again, but the bodice needed several adjustments to make it work. On the other hand, the fabric exceeded my expectations and is a big reason why I've been wearing this dress a lot in the last few weeks since it got hot. The fabric is a soft rayon spandex (95%/5%) blend called Fiesta Ikat Printed Knit that I got on Craftsy. It's sold out now, but any mid-weight knit would work for the pattern. It's very comfortable, washes well and you can see from the pictures that even though I wore the dress all day and set in a hot car, there are no wrinkles. I'm sure this dress will continue to get a lot of wear this summer. Now on to the cardigan. 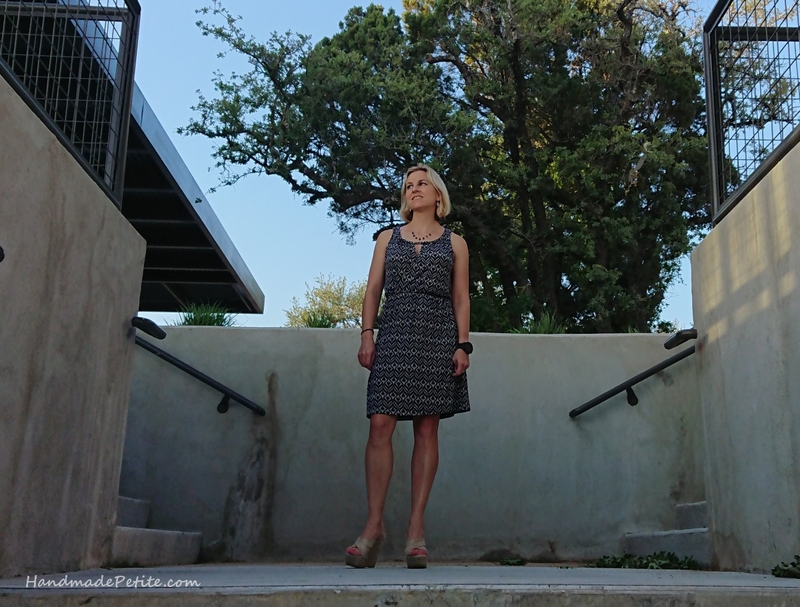 I was intending it to be a standalone post, but since I took the pictures while wearing the new McCalls dress, might as well talk about it now. This is the Casta Maya pattern by Patty Lyons. She was running a KAL (knit-along) starting in February so I actually cast this pattern on at the Hill Country knitting retreat. I finished the cardigan almost a month ago, within a week of the KAL ending. However, I didn't take any pictures because I was intending to redo one of the collar pieces. Somehow I picked up the wrong number of stitches and the corner of my left collar ended up sitting more than an inch below the right. I couldn't hide it during blocking so I was a bit disappointed and cast the project aside for a while because I was dreading the idea of spending another full day on a piece I thought I was done with. Well, I finally got ready to rip it out this weekend and took it to my LYS to work on for a bit, but the wonderful ladies there talked me out of it. They all said that they couldn't see it especially as I was moving and to just leave it. I was still skeptical, but decided to leave it for at least a few months and see if it's still bothering me. I was actually surprised that when I took these photos that it didn't really stand out as much as it had when I was looking in the mirror. The whole garment shifts and collar curls as I'm moving so maybe it's really not so bad. Collar user error aside, this is a really nice summer pattern for drapy yarn. Patty's KAL had super detailed instructions and videos so even though a number of techniques (ex: turned hem, German short rows, long lace sections, seaming etc) were relatively new to me, I had no problem finishing this piece. It has a beautiful lace pattern in the back and at the ends of sleeves, but it's relatively easy to do once you get going. I made a few mistakes here and there, but the whole thing was done in a few months which is fast for me given that I was knitting this on size 3 needles. I definitely recommend this KAL. The official deadline passed, but the pattern and thread are available to join any time and Patty is amazing at monitoring these threads and helping. The only problem I had was the yarn, but that was partially my fault since I didn't use the recommended yarn. I think it was actually a decent substitute in terms of body and drape, but the yarn itself shed a LOT! I was really surprised since it's a rayon/linen/silk blend, but I was covered in white while knitting it and even after 2 washes it's still shedding a bit. I really hope this gets better so it's not a pain to wear. I have a lot of knitting projects in my queue, but I may actually knit this again in a different yarn just because it's such a practical piece for warm weather. This is my ravelry page for the project if you want to know more details about the project. Thanks for stopping by.